The Surin Islands are located in the northern rim of the Andaman Sea, about 10 kilometers south from the official Thailand-Myanmar border and 60 kilometers west from Thailand’s mainland. The common port of departure is the Kuraburi pier of the Phang Nga province. The Surin Islands consist out of five islands, Koh Surin Nua, Koh Surin Tai, Koh Ri, Koh Kai and Koh Klang. 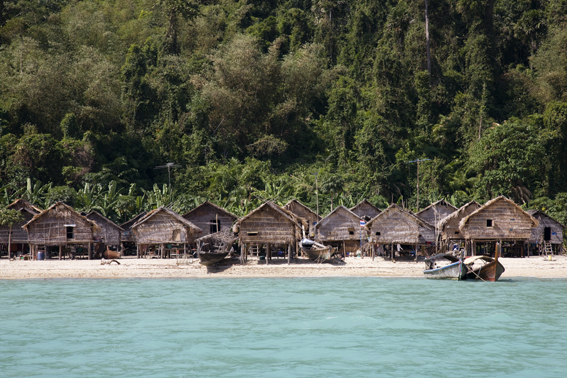 The Moken Sea Gypsies use to navigate around the islands and stay in different bays, yet nowadays they are permanently located on Surin Tai, the big southern Island. 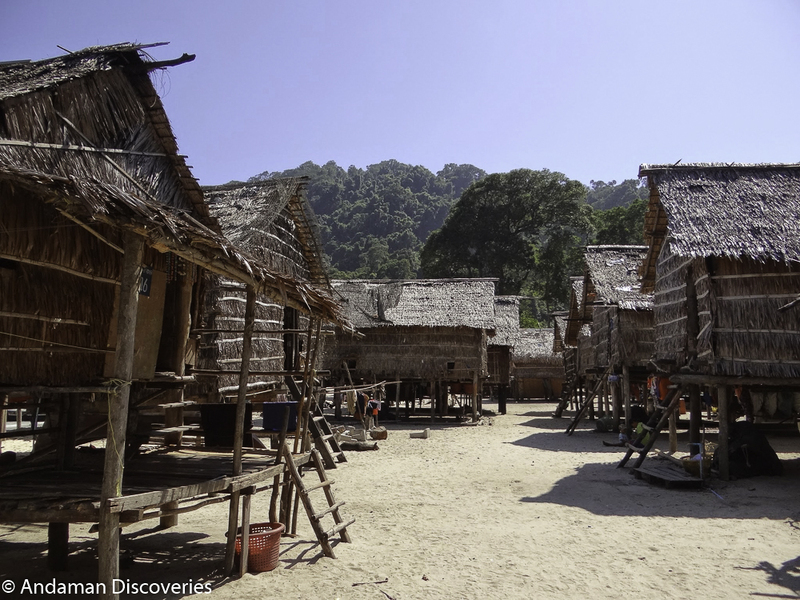 The Moken village in Ao Bon Yai counts 70 households that are inhabited by 300 people. The village also hosts a health center, a school, and an information center. The Moken are sea nomads that traditionally lived and travelled the Andaman Sea between Thailand and Burma. In the 1990th they started to settle on Koh Surin permanently. Before the Tsunami in December 2004, two Moken villages were located in “Sai End” and “Ao Bon Lek”, counting about 20 households in each village. On December 26, 2004, the Moken, as people of the sea, noticed the change in the water and fled up the hill. Unlike other places affected by the Tsunami, no person was harmed, but just like other places the houses were destroyed. In 2005 the two villages have been reconstructed as one in Ao Bon Yai. resting and fishing for domestic use. Dry season is the time that allows moving around and is hence defined by work. As the national park is open during dry season, this time is dominated by tourism. and learning from the Moken way of life. All we ask of visitors is to be patient, open-minded, and willing to accept new things. Be aware that your presence makes a difference. In being interested in the Moken you empower them to be proud of their culture. Make sure to promote responsible behavior and only share the best parts of your culture. For example, being part of a kid’s game is more respectful (and more fun) than showing your newest camera model and the amazing picture you took of the village elder. Thank you for choosing responsible ways of traveling with Andaman Discoveries. A long time ago, prince and princess lived together peacefully. They shared their time and their love. One very dark night on his way home the prince was confused and entered the wrong house. It was the room where the princess’ sister lived. The princess heard her husband entering her sister’s room and got angry. She put a curse upon them that kept them from ever having a permanent settlement. So the prince and his new companion were banished to roam the seas on their nomadic houseboats. 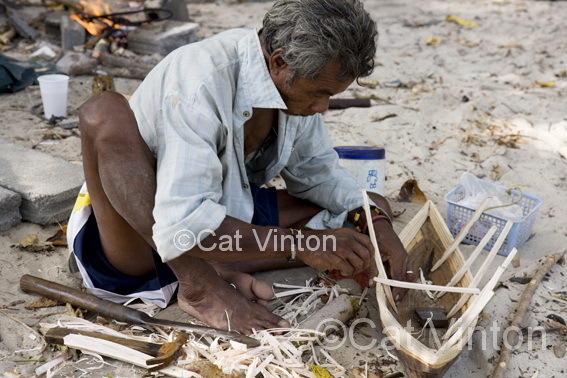 As sea gypsies, the Moken are both hunters and gatherers with exceptional skills. The spear is used for hunting underwater and for the surface, yet this type of fishing is restricted nowadays by the national park. 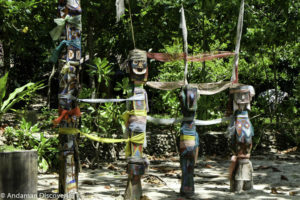 For generations, the Moken have made use of the rich diversity of plants and woods in the surrounding jungle. In the back of the village you can find a trail that features medicinal herbs, edible plants and different woods used to make tools, boats and houses. You might also see monkeys, squirrels and other wildlife. Be aware that there are ants and mosquitoes awaiting you. 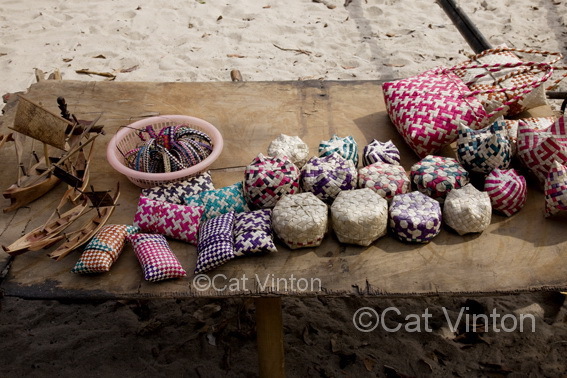 Traditionally, the dry season was the time to move around and work, trading merchandise and fish and maintaining the good condition of boats and houses. 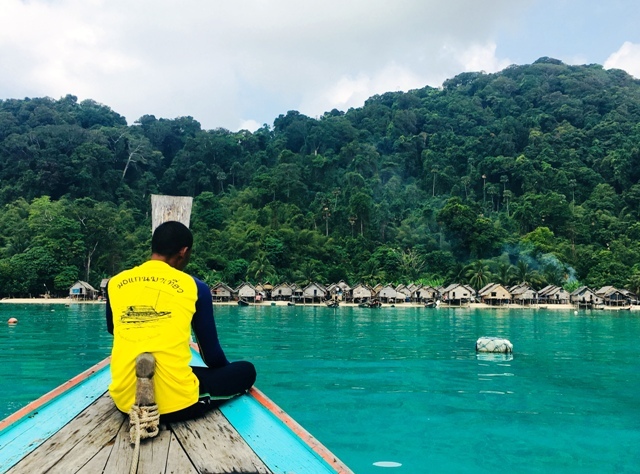 The construction of kabang houseboats and chaban boats are protected by law and the trees for these boats cannot be cut from the National Park area anymore. Consequently, the beautifully miniature boats receive more attention to be sold as handicrafts. 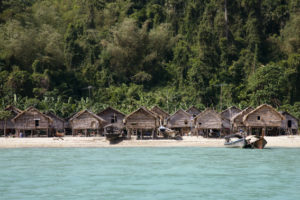 The rainy season is the time of rest, which means building houses to stay in the bays. The main activity during this time of the year remains the same until now: fishing and collecting shells and sea cucumbers for domestic use. 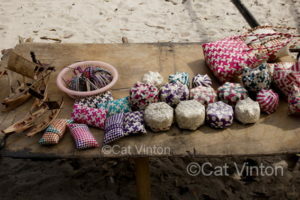 Moken Village Tour if you come with a responsible tour operator, you can be sure that the Moken receive payment for their services, and you are welcome to further support their community by purchasing handicrafts. If you are visiting independently, you can hire Moken guides for the nature trail, for trying out spear fishing and rowing the chabang boat and for adventurous boat or snorkeling trips on the long tail boats. Thai or Moken language is required. 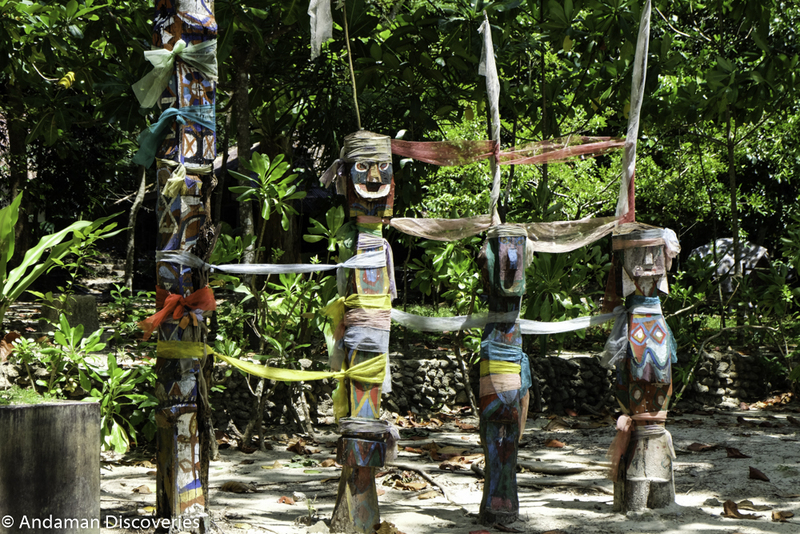 The Moken have an incredible knowledge of the plant and nature that make up their surroundings. Passed on from generation to generation, they know which leaves to use for medicine, where to find food and fresh water, and which trees are suitable for construction of boats and houses. On this trail you can find plants for all different uses. The Trail leads you past a beautiful viewpoint that overlooks the village and the bay where one of the emergency escape routes for the Tsunami ascends. Keep your eyes open for wildlife, including giant flying squirrels, monkeys, hawks, and flying foxes and bird species such as hornbills, Nicobar pigeons and hawks, or other types of birds. On the trail you will find Vitaceae, which is a type of sour leave that is used for cooking. In its raw condition, the leave will give an itchy sensation. The Hyi Tree needs to grow for over 30 years to carry the first fruits. The dark ripe fruits taste sweet and sour and have been given the nickname of velvet tamarind. During the rainy season the shooting bamboo is a source for delicious cuisine. Furthermore, you will find ground potato and other edible fruits on the trail. There are two main types of medical plants, Uncaria and Ga-e Lapeng, along the trail, their leaves are used to smoke poison out of wounds. Additionally you will find leaves that bring down your temperature in times of fewer; and a type of herb that helps against jelly fish stings. 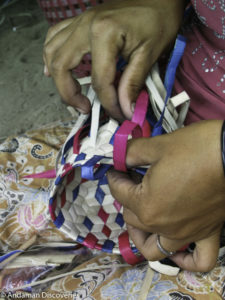 The sides of the boats and houses, as well as the roofs, are woven. The leaves for weaving come from the Elephant Cry tree and wild Pandanus. The Dinochloa Vine Bamboo is heavy and strong – the perfect material for making spear sticks and in older days smoking pipes. Bamboo can be used for the floors or the sides of houses.